Allergic rhinitis is the medical term for allergies and while you might think it’s just from pollen or pet dander, or maybe gluten or dairy, that’s not really the case. Pollution is a big trigger for allergies and in cities where fracking takes place, respiratory and lung function takes a hit. In the last 50 years, the rise in prevalence of allergic types of conditions has risen in our industrialized world. Symptoms vary from flare up to flare up, and person to person. Symptoms may include a runny or stuffy nose, itchy nose and throat and all that goes with unpleasant sinus and nasal reactions. The immune system gets involved too, this is why antihistamines don’t cure you completely. 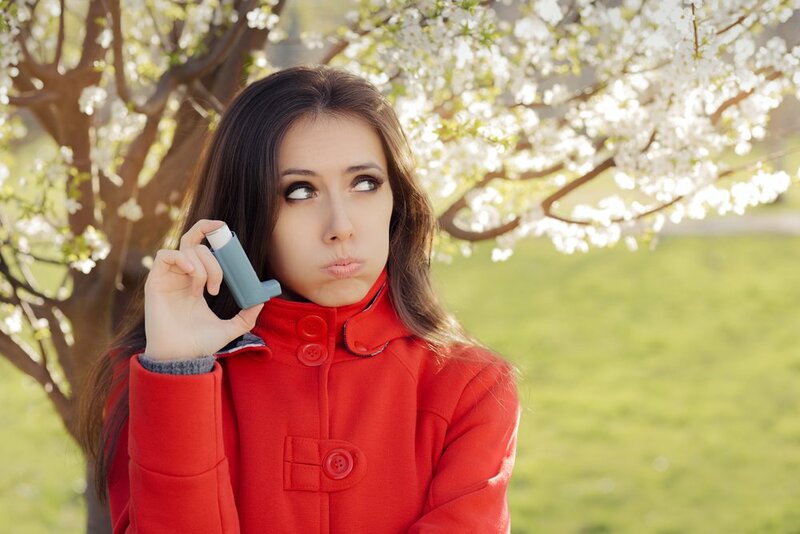 Allergies can be life threatening, leading to inflammation and shortness of breath. About 40 to 60 million Americans are affected by allergic rhinitis. You may willingly take antihistamines to get immediate relief from the miserable sneezing, runny nose, scratchy throat, watery eyes and congestion you’re suffering from. But some of these medications have the potential to harm your brain. By “harm your brain” I’m talking about how some antihistamines cause mental or cognitive side effects, I don’t mean literal brain damage. I’m sure you’ve experienced this effect if you’ve taken a “first generation” allergy drug such as diphenhydramine and chlorpheniramine. These drugs have the ability to cross your blood-brain barrier, interacting with a number of unintended receptor sites. This annoys specific neurons in your brain causing you to feel like a zombie, or feel hungover, perhaps like you’re drunk. Then you begin to bump into walls, feel jelly legs, or forget things and get sleepy… almost as if you got drugged up. Well, and you did! Brain fog and fatigue may be expected to continue as a hangover the next day, especially if you’re particularly sensitive or if you take too big of a dose. Avoiding medications and their dangerous side effects can be accomplished if you are able to choose natural remedies or avoid allergens that trigger you. When your body is exposed to allergens, it reacts by releasing histamine compounds that attack cells in your body, causing them to swell up and leak some of their fluid. This histamine (and other compounds) cause common allergy symptoms like watery, itchy eyes, sinus congestion, swollen nasal passages, itchy skin, runny nose and incessant sneezing. I don’t want to paint histamine out as if it’s all bad. It’s not. You need some histamine because it functions as a neurotransmitter, and it plays a role in sleeping and helping us to remember things. No wonder that ANTIhistamines trash your memory. But too much of any good thing is a problem. Certain types of histamine compounds help with digestion and acid production. Histamine has some type of protective role and when it spikes during an allergic fit, it’s almost like a red flag that you’re dehydrated. When histamine is high, you could safely assume you are low in water, so drink some. Many physicians will support a patient on various antihistamines to control this, some drugs like Singulair to control leukotrienes, and various inhalers if breathing is compromised. This chemical soup can “drug mug” all kinds of nutrients from your body so if you use these drugs, look them up in your copy of Drug Muggers so you can put back the lost nutrients. You can’t live on inhalers and pills for the rest of your life, that’s not a solution, but it’s great for temporary help. I do recommend these things temporarily, just find the underlying triggers and support your immune system and diet. People who suffer from allergies are often told to avoid triggers, but that is nearly impossible when the seasons are changing and our immune systems are impaired by the food industry, air pollutants and household chemicals and toxins. Thankfully, some powerful essential oils serve as a natural and safe way to treat the symptoms of allergies and boost our immune systems. The obvious things is to keep your immune system working well, and stay physically active if possible, minimize your stress and get enough sleep. There’s no faster way to crash your immune system than twirl stressful thoughts around your head and lose sleep over it. It’s not like you can control it anyway right? So a healthy immune system is key to outsmarting allergies. All of them… food, dander, trees, weeds, dust and more. Diet is huge too, avoid processed sugary foods as well as known food triggers like dairy and wheat. Antihistamines block the action of histamine. Keep in mind that some histamine is good for you. You want it around because it’s a neurotransmitter and it’s responsible in part for healthy sleep. It also plays a role in helping us retain memories, that’s why antihistamine drugs make you forget stuff. It’s true some of you rely on these meds. So if you have to take a drug that causes you to feel weird, then start taking a low dose a month or two before the season actually hits. Take it at night so you can sleep through the sedation. Stay hydrated. The newer generations of antihistamines like loratadine are much better than older ones like diphenhydramine, but they are still very drying. Many of you write to me asking for natural alternatives. Today I’ll give you some options. I love going to these places. Breathing in the air that has been infused with salt can be very relaxing and soothing to sinus passages. It’s called halotherapy. I’ve been to a small one in Denver, and a big one in Santa Barbara. They were both awesome to visit but not every city has a nice salt cave so this is not an option for all of you. What about salt itself? In a word, YES! Salt is an overlooked folk remedy for allergies. During a flare, you can a dab of unrefined salt on the tip of your tongue and let absorb. You can also put 1/4 teaspoon in a cup of water and drink. Drinking water is important. Within minutes of an electrolyte or salt water drink (1/4 tea to a cup of water), things may calm down. I’m not referring to table salt, I’m referring to the mineralized salts that are unrefined (Celtic is ideal). Himalayan could help too. Don’t bother if all you have is table salt, it’s just sodium chloride, there are no minerals. One whiff and you’ll see this opens up your lungs and sinuses. It has antibacterial action on germs that hide in your lungs and sinuses. It’s often used in flu remedies and nasal sprays. This natural plant extract contains many volatile oils including “citronellal” which helps with pain and inflammation. A 2011 article (Evidence-Based Complementary and Alternative Medicine) found support for eucalyptus essential oil as an effective treatment for upper respiratory tract infections and it’s easy to use for allergies. Just put 2 drops in your hands and rub together then cup your hands and inhale or rub on your chest. You can put 5 drops into an aromatizer and diffuse through the walls. I’ve written about this supplement which is helpful for joint pain, but it can serve as a natural antihistamine. It works by donating a “methyl” group to other compounds to form nutrients like methylfolate, methylcobalamin and dozens of other nutrients and enzymes. Over time, a low dose like 200 mg per day might help reduce histamine levels and a hypersensitive immune system. If you are prone to allergies or skin rashes it’s possible you have higher levels of histamine and decreased methyl groups (or reduced methylation). Methylation reactions are what helps to break down your histamine so that’s why the methyl groups you get from SAMe could help. SAMe itself is not an antihistamine though. You should read this article I wrote, Genes, Methylation and Your Health to gain perspective on a topic that could change your life. Most of you know this enzyme already because it’s found in pineapples and pineapple juice, but can also be purchased in supplement form and it’s found in many multi-tasking formulas to support immune health. Bromelian helps with allergies because it blocks the action of substances that cause inflammation and swelling, and mucous production.It seems to be good at thinning mucus, making it easier to inhale and exhale from both your nose and mouth. This supplement has supporting research proving it can calm down symptoms of seasonal allergies by reducing inflammation and supporting your immune system. If you have allergic rhinitis, in just a week or two, you might see benefits from propolis. It inhibits or blocks histamine release. I wrote about propolis and its incredible effect on your immune system, so for my article CLICK HERE. Chlorella is a type of algae that grows in fresh water. The whole plant is used to make nutritional supplements and medicine and in fact, it’s such a game-changer that I put it into my custom superfood formula Thyroid Greens. Chlorella itself is very rich in amino acids, peptides, vitamins, minerals and nucleic acids. This algae has been studied for its effect on the immune system and white blood cell counts (in people with HIV, cancer or other bad infections). The nutritional content may help with immune function especially in people with allergies. In an animal model study, mast cells (that produce histamine) were provoked, but the chlorella prevented the release and bolstered immune Interleukin-12 or “IL-12” and Interferon gamma. A human study found similar immune-boosting effects by chlorella. It was a randomized, double-blind placebo controlled trial and 5,000 mg of chlorella was given to healthy people. Once again, the Interleukin-12 and Interferon gamma levels increased, and an increase in natural killer cells and T-helper 1 immune function. If you have stubborn allergies, you can try chlorella or superfood green powders that contain this ingredient. You can get this naturally from citrus fruits and salads. Vitamin C is a powerful antioxidant with many well-documented health benefits. It helps prevent formation of histamine and suppresses inflammation by supporting your immune system. This is a well-known natural antihistamine and it shouldn’t cause “stinging” that’s just the name of the plant. Scientists have found that more than half participants report relief of symptoms by using approximately 300 mg of freeze-dried stinging nettle herb (on a daily basis). But the dose varies from person to person. This herb is rich in carotene, quercetin and vitamin K. When choosing stinging nettle, the leaf extract of “Urtica dioica” might be better, whereas root extracts may help with male prostate problems. You could also try teas. Too much will cause diuresis, so be careful with that. If your eyes are irritated and blood shot, you can rinse some them and soothe them within seconds. It’s so simple, so you can buy eye cups and soothing saline eye washes at any pharmacy. These help with red, puffy, itchy eyes that are swollen. You just lean over the sink, and tilt your head back with the eye cup and saline rinse. Don’t add anything to the saline water, use the solution that comes with your eye cup.